Many moons ago, I suggested that microlots can help everyone in the coffee trade, even farmers who don’t produce them and roasters who don’t buy them. The argument is that by better understanding the quality of the coffee they have to offer — a skill that is developed naturally in the pursuit of microlots — farmer organizations can offer differentiated products to different buyers based on those buyers’ specific needs, and maximize their sales revenues. I wanted to develop a graphic to go with the post and illustrate the argument, but didn’t have time. The recent discussion here of assessing impact at origin has given me the push I needed to get the infographic done. These graphs are stylized — they do NOT represent real data from CAFE Livelihoods or any of our other projects at origin — and represent a mythical Fair Trade Certified cooperative of 500 farmers that sells 1 million pounds of coffee a year. They are, however, “inspired by true events,” as they say in the movies. In the graph above, the cooperative takes a segmented approach to marketing, offering five different products based on a combination of quality (intrinsic value) and certification (symbolic value). By separating quality-differentiated lots, the cooperative creates the possibility of achieving some high price points on its conventional coffee, even if only for a fraction of its coffee. In the graph below, the cooperative does not segment its coffee on the basis of quality, but blends coffee from all its members without regard to terroir or quality, selling what it can on the FT market and the rest on the conventional market. 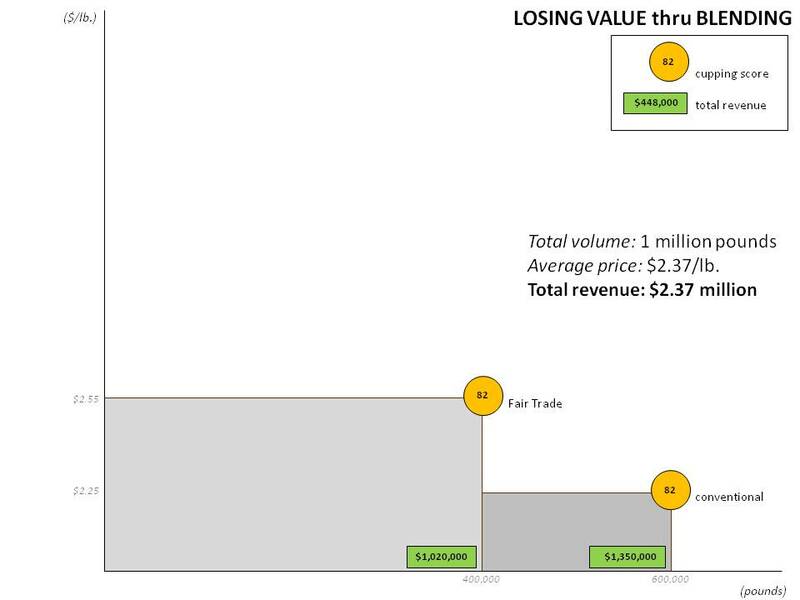 Under this scenario, the value created by the 92-point lot that fetched $3.75 from a Direct Trade roaster, and the 84-point double-certified lots sold at $3.30 a pound, simply evaporates. The average price under a segmentation scenario is $2.59 per pound, and just $2.37 per pound under the undifferentiated approach. Over a million pounds of coffee, that adds up to a difference $222,000. Value evaporates when high-quality coffee is blended with lower-quality coffee. These scenarios are simple. In reality, smallholder cooperatives are increasingly going beyond generic cup quality in differentiating their coffees for different segments of the market. Many, especially those with a large number of members spread over large areas that contain significant agroclimatic diversity, are creating regional profiles that combine intrinsic value traits (terroir) and symbolic ones, including ethnicity, language, etc. Why did the recent discussions of impact at origin prompt me to finally create these graphs? Because the original infographics I published using CAFE Livelihoods project data seemed to suggest that Direct Trade is a superior option because it delivers a higher price-per-pound. 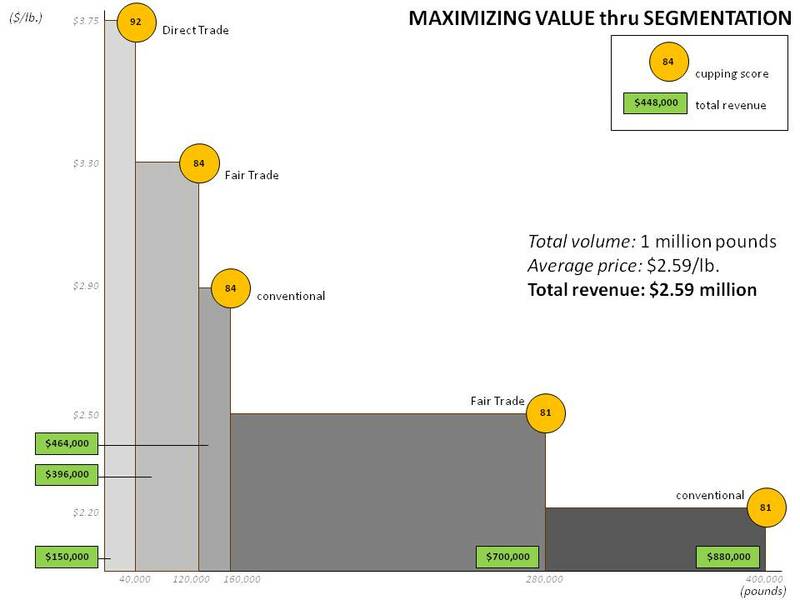 And the second set of infographics I published suggested that Direct Trade’s impact was less significant since the volumes traded — and revenues generated — under the approach were lower. But in our experience, it is not an either/or decision for cooperatives. Successful cooperatives work strategically to migrate more of their coffee to higher-margin channels, but it is not easy. There are challenges at the field level. Differentiation can be associated with new technologies or field-level investments, and almost always involves more labor, whether from a farmer’s own family or hired hands. And there are limitations in the marketplace. Even if the quality narrartive is ascendant in the marketplace, the combined market share of the Fair Trade and quality-obsessed/Direct Trade models is still limited. As much as cooperatives might like to sell all their coffee at high prices through direct trading relationships based on Fair Trade principles, there just aren’t enough buyers in those categories to go around. Coops must sell at lots of different price points to a broad range of buyers through lots of different kinds of channels in order to find markets for all their coffee. The developmental impact of the trade is cumulative, combining what coops get from each of their buyers — income, market intelligence, new technologies, reinvestment, etc. Differentiation for diverse segments of the coffee market is an important part of a competitive strategy for smallholder coops. Effective differentiation on the basis of instrinsic and symbolic sources of value can help coops maximize revenues. A quality focus is an important part of a differentiation strategy, but is not a stand-alone option for smallholder coops; if one trading approach seems to outperform another one in terms of income or impact, it may be an optimal strategy but can rarely be an exclusive one. We need to measure more effectively the return to investment in quality-based differentiation that considers both direct costs of production and opportunity costs of labor and production in the event that high-quality heirloom varietals underperform other, higher-yielding varietals. Once again, very good use of infographics to discuss important questions. Though I too have subscribed for years to the idea that differentiation holds considerable potential for coops (increase quality/revenue, establish positive feedback loops, more targeted investments, etc), a roaster friend recently questioned whether some coops would be worse off differentiating their coffee. Specifically, he wondered if removing the higher quality coffee from the rest could impact price enough for the majority of coffee produced to result in a net loss of revenue (or a wash). Your model suggest the impact to overall quality would be minimal (1 point), though I wonder if he has a point in some circumstances. This is in addition to the costs that would come through differentiation. I still believe differentiation is a strategy coops should really consider (at least, those who haven’t already), but I wonder if you’ve seen anything to shake your faith in it. Happy New Year and thanks for yet another thoughtful comment. I know I still owe you more on the CAFE data, but my day job here in South America is getting in the way of my efforts to analyze data from Central America and blog about it. I hope to get to address some of the issues you raised in previous comments soon. Meantime, a quick reply to this more straightforward question. While we are increasingly committed to helping cooperatives pursue a strategy of differentiation, we are also mindful of its potential shortcomings. The primary critique of quality-based differentiation — which I have discussed here in past posts on Direct Trade — is that separating out the highest-quality microlots can undermine social cohesion and weaken smallholder cooperatives. This is especially true if one community in a cooperative’s area of influence has agroclimatic conditions more conducive to coffee quality than others. If this coffee is sought out, celebrated and purchased directly at premium prices, it can create incentives for splintering and resentment among other members who have less potential for high quality coffee. And, as you note, it can deprive cooperatives of their best coffees. In order to avoid the splintering cooperatives must devise and implement quality incentive schemes and programs to help all members improve coffee quality and earn market premiums. Another leading concern — and one we hope to study carefully in our Borderlands project here in Colombia and Ecuador — are the production costs associated with differentiation. It may be that the additional costs associated with meticulous selection, special post-harvest technologies and additional traceability requirements for microlots make them less profitable than they might seem given the high prices they can fetch from the right buyers. On the issue of needing an approach in which microlots don’t undermine coop cohesion, I through EE’s approach was a great innovation for that. Seems to me a farmers’ coop could do the same (if it wanted to get into microlots), paying a price inventive on process rather than result. 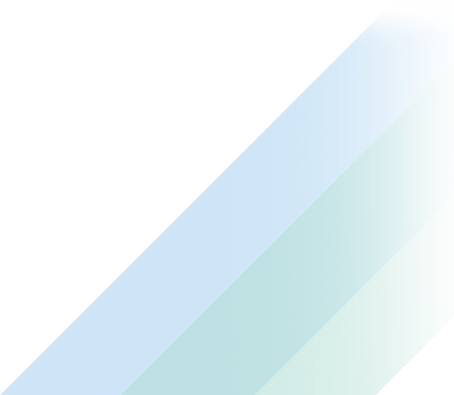 Gets away from the the issue of some members having a better climactic bounty while rewarding those who put in the time and care, and getting the coop producing the best possible coffee. No problem on the delayed data. You’ve done quite a lot already, and I’m sure most readers appreciate it.